The Zen Oracle putter range is not new to the putting world, it won the Golf Digest Hot Product award in 2008, for both their mallets and blades, but Zen still is not a household name, which we think at best-putter.com think is a bad thing! The range is extensive and their unique selling point is that they use ridges on the putter face which are claimed to reduce the dispersal of putts due to the uneven dimpled surface of the golf ball. The company has launched Mallets, Mid Mallets, Blades, Centre shafted putter designs and a training tool, the "Zen I". They've also teamed up with "The House of Zen" - a high tech fitting centre in Singapore and their advanced putting training methods have added to the credibility of these already "playable" putters. 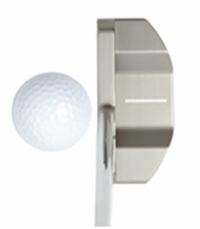 The Zen Oracle putter design revolves around the use of face "ridges"... Don't call them grooves! "What's the difference?" I hear you ask. Well, imagine roadwork construction. Grooves are drains, and ridges are speed humps, one has been cut out, one has been added on. "A marketing play on words" I hear you say. But the engineers at Zen beg to differ. They call it RDE, Reduced dimple error. The ridges are designed to reduce off centre hits caused by the balls dimples. The House of Zen, is based in Singapore, you can choose your head design, you are then put your stroke through a number of tests including being "lasered" on the SAM putt Lab, and you are recommended a shaft and grip combination as a result. After some field trials you return to the House of Zen for any loft, lie or grip changes that are needed, these are always available with a Zen no matter how long you have owned it. The Zen designs range from traditional Anser style designs which Zen calls "blades" to quite futuristic "mid mallet" and "mallet style putters" all of which are face balanced. I have always preferred a mallet style putter, it helps with my alignment, but after trying the mid-mallet Zim model I am back to a more blade-like model. They class it as a Mid Mallet, but it looks more "Bladey style" to me… Mine is heel shafted. It is quite heavy and the shaft is a little longer than standard, that's what the stats recommend and it feels really good. The level of customization available on a Zen Oracle putter is the impressive part - if you're someone who prefers your hands to be behind the ball at setup and impact, and if that's what gets the ball in the hole, then that is how your Zen is setup. I have used many putters with grove technology throughout my career, Yes and Rife to name two, the Zen does feel different upon impact, the ball comes off the face with a much more positive roll. The Zen I Tool Training with the "Zen I" tool compliments the putter. It easily attaches to any putter face, Mallet, Blade it does not matter. It trains the user in the correct backswing path, not too steep on takeaway else the ball slips out, correct transition and release technique. Also teaching you to keep the ball on the correct target path, I feel it will improve your putting technique no matter what your ability level. Having used and watched the process from the beginning of the new Zen Oracle putter series, I can highly recommend that you find and try one, I think you will be very pleasantly surprised by the look and the positive roll. Not sure if a Zen Oracle putter is for you? Click here for our article on choosing a putter to fit your stroke.